Autumn is finally gaining more presence, which is for many their favorite season of the year, since it implies a breath of fresh air (literally) after the hot summer days. For some, this is the perfect time to hide indoors seizing the arrival of the cold and catching up with all those movies, books and TV shows that have been left aside for months, but let’s not forget this is also the most magical moment to get to explore and enjoy nature, that dresses up with the most vibrant and bright colors, creating a spectacle which lasts for just a few weeks before disappearing completely under the white layers of the snow. If you need to do a Game of Thrones marathon before the next season begins, don’t worry, we wouldn’t want to deprive anyone from such a noble task… but if you are one of those that prefer to breathe the clean air of the mountain, get lost in a centennial forest or listen to the sounds of nature in silence, here’s a list with best five places in Catalonia to enjoy autumn like never before. The Montseny massif was the first area in the Catalan community to be declared a Natural Park and Biosphere Reserve by UNESCO, and given its proximity to Barcelona (just an hour's drive) Montseny is an oasis of peace for all those who want to get away from the noise of the city. What makes this natural landscape such a magical place in autumn is its extraordinary diversity of landscapes, which changes radically depending on the altitude, making the Montseny Natural Park a small miracle of nature with an immense variety of ecosystems. If you decide to go, do not forget to take an empty basket with you. You will need it to collect all the mushrooms you can find! 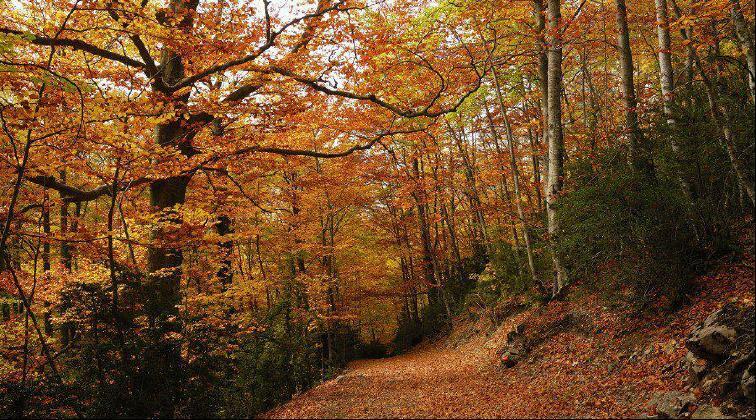 If we talk about autumn in Catalonia, we cannot forget the Jordà beech forest, since it is one of the best places, not only in Catalonia, but also in all Spain to get lost in the colors of autumn. Although it is a spectacular forest throughout the year, its most photogenic moment is when the beech leaves begin to carpet the forest floor with all the chromatic variation of this season, making it an image worthy of a movie. There is not a single defined route, so we recommend to wander through the multiple paths of the forest as you reach deeper in the heart of nature. This is one of those places for which it is worth to stop doing everything you are doing and start exploring this unique forest in Spain. Although the Jordà beech forest is the most famous beech forest in Catalonia, the beech woods of Grevolosa, much more unexplored, is not far behind in showiness. With more than 300 years of life, the beech woods Grevolosa is one of the most magical forests of Catalonia, populated by monumental trees that can reach 40 meters high, even preventing sunlight to go through in certain areas. Autumn is undoubtedly the best time of the year to visit it, which is why we invite you to tour it while your senses flood by the mysticism and exuberant beauty of this ancient woods. With solitary streets, stone houses and a 100% natural environment, the medieval town of Rupit i Pruit, on the edge of the province of Barcelona, represents one of the most charming corners of this list. In this location, autumn will greet you even before your arrival, since the roads that lead to Rupit i Pruit are populated by deciduous trees, making the way to the town as enjoyable as the destination. Once in the village, you will soon notice the smell of firewood and chestnuts invading the atmosphere of the place, which seems to have been frozen in time hundreds of years ago. Whenever you finish your rural breakfast, you can finally begin your hiking to the Salt of Sallent, the largest waterfall in Catalonia (even higher than 100 meters) all framed by the multicolored mantle of autumn. Last but not least, very close to the Aran Valley, the National Park of Aigüestortes emerges, which is the only national park in Catalonia and constitutes the pure essence of the Pyrenees. Its sharp terrain, with deep valleys and high peaks, creates a unique landscape that holds one of the biggest varieties of wildlife of the entire Pyrenean area. The intense autumnal colors of Aigüestortes are exuberant, however, here they must share the spotlight with the water, because the beauty of the brave rivers and lakes that spread through the park doesn’t go unnoticed. Our advice? Spend the night in one of the many mountain shelters in the area and go out to discover the autumn just at dawn, when the animals begin to wake up and the reddish light of the morning begins to bathe the top of the mountains. And there you go! Now you only need to wear your hiking boots and get out there to behold this beautiful spectacle reserved only for the curious who dare to venture into the unknown.